Nissan’s second-generation Leaf is almost but not quite 100% new. If we were looking at a living creature rather than a car, we might say that the skin, muscles and internal organs have all been replaced but the skeleton remains the same. As a result the new Leaf is more powerful, lasts longer between charges, looks a lot different, but retains the same basic size and shape as before. The exterior design is a lot crisper and less duck-billed than the old version, but the new Leaf remains a little awkward looking from some angles. A complete redesign would probably have done more to alleviate the car’s heavy look around the rear haunches. The visual refresh does bring the Leaf neatly into line with the rest of the Nissan range, however, where it now resembles a bigger version of the sharply styled Micra supermini. Of course outward appearances are a lot less relevant than inner strength in an electric car. Most importantly, Nissan has squeezed 40kWh of electrical storage into the new Leaf without changing the volume or shape of its lithium-ion battery. 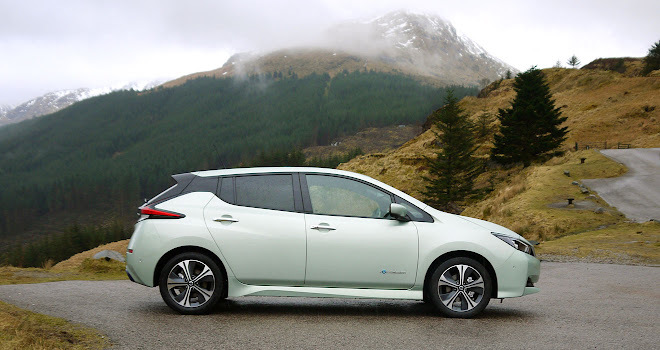 The old Leaf was launched in 2011 with a 24kWh battery and an optional 30kWh upgrade arrived in February 2016, so the new car has moved energy storage along by a reasonably big step. The new Leaf’s battery capacity still falls a long way short of the new wave of premium EVs such as the Jaguar I-Pace, where 70kWh to 100kWh is the ballpark required to play against Tesla’s Model S, X and 3. 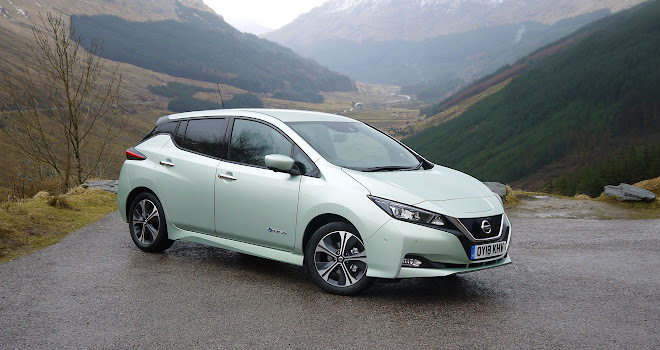 Nissan reportedly has a 60kWh option up its sleeve for the Leaf in 2019, and there is also the somewhat important topic of price, given that big batteries cost a lot to make. Prices for the new Leaf start at £21,990 on the road for the most basic Visia trim level, rising to £29,155 for the top-of-the-range Tekna (including government incentives). For now, 40kWh is still a very useful amount of energy in an electric vehicle. 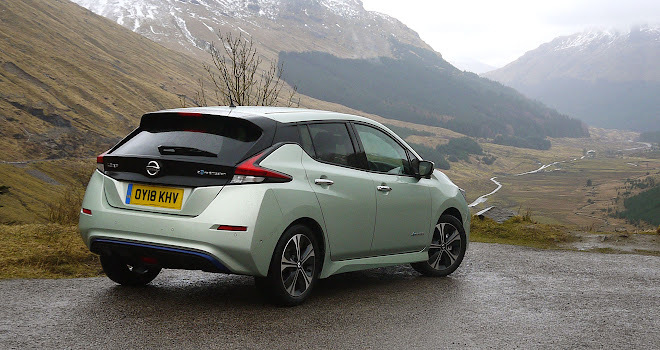 The sparkling new Leaf I sampled showed a range of 160 miles in its instrument cluster at full charge, compared to the 105 miles typically predicted by a fully topped up first-generation Leaf back in 2011. And if a 52% range improvement seems disappointing for a 67% bigger battery, that’s partly because the first Leaf was an eternal optimist whereas the new one is more of a grudging realist. 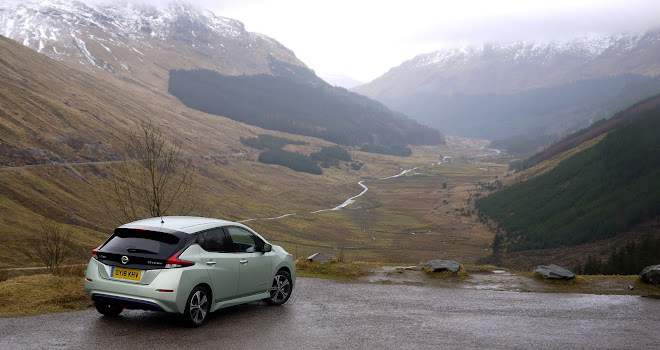 I tested the new Leaf over two days, the first of which involved a few hours travelling north-west from Glasgow to the Isle of Eriska in Scotland. With no topping up en route we arrived with an indicated 42 miles of range to spare, having covered 101 mixed miles of motorway, town and breathtakingly beautiful rural roads. The trip was covered on a mild spring day with only two people and light luggage aboard. While not quite matching the 160 miles indicated at the start, the ability to cover 100 miles with 40 in reserve and no charging kerfuffle along the way felt very welcome indeed. Anyone wanting to cover much greater distances might have pause for thought, however. 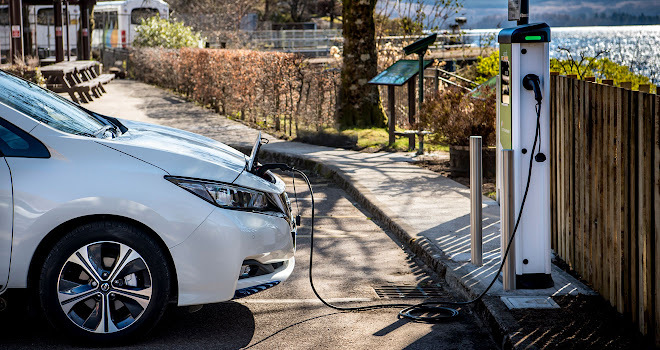 Some early customers of the new 40kWh car have reported problems when using rapid chargers to give the Leaf a quick high-power top-up along the way. All UK versions of the new Leaf include two separate charging sockets, mounted side-by-side under a single flap in the car’s nose. The smaller one charges at up to 6.6kW from a domestic wallbox, while the larger one can funnel up to 50kW into the battery, using the kind of high-power rapid chargers found at motorway services. 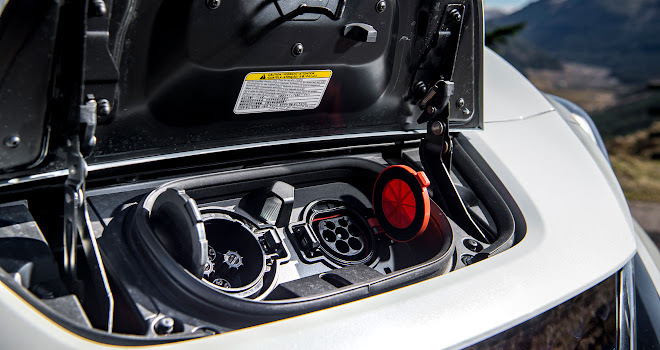 Charging through the bigger ‘Chademo’ socket is supposed to provide 80% capacity in 40 to 60 minutes, whereas the smaller wallbox socket requires up to 7.5 hours for a full charge. Some drivers of the new Leaf have found that a second or third stop sees energy dribbling rather than gushing into the battery. Last week Jonathan Porterfield, founder of EV dealer Eco Cars, posted a video showing his new Leaf charging at 22kW during its third visit to a 50kW charger in a day, with the instruments predicting 2.5 hours for a 75% charge – a far cry from the expected 40 minutes to 80%. He noted that he’d have completed his journey more quickly in his old 30kWh Leaf, which suffered no similar setbacks when repeatedly charged at high rates. 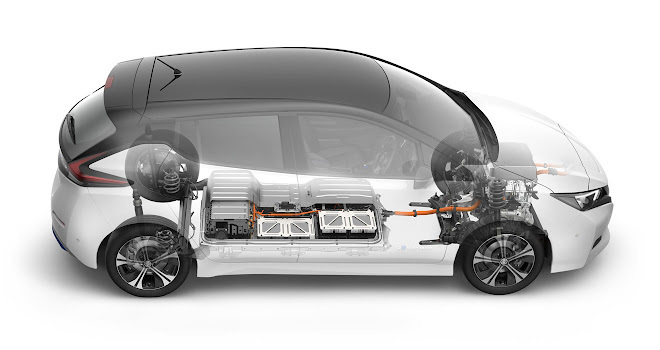 Some EV enthusiasts have been quick to lay the blame on Nissan’s passive, air-cooled battery design, because most rival EVs incorporate active thermal management of the battery – cooling each cell with air or liquid circulated by a fan or pump. They suspect that the new 40kWh battery is in danger of overheating when subjected to high-speed running followed by rapid recharging without a break, and that the Leaf’s monitoring software is stepping in to protect the lithium-ion cells by throttling back the flow of charge. Other explanations are possible, such as undetected software errors or unforeseen incompatibilities. A Nissan spokesperson confirmed that the company is in touch with Porterfield and other affected owners to investigate their experiences. The new Leaf has made progress in other technical areas. A new ProPilot function fitted to Tekna models (or a £400 option on N-Connecta variants) provides active cruise control with lane-keeping. It uses a camera to spot lane markings on dual carriageways, keeping the Leaf neatly centred at a safe distance behind other vehicles. I found the system easy to use and simple to adjust using wheel-mounted controls for adjusting maximum speed and the gap ahead. ProPilot works right down to zero and will make sure you keep your hands on the wheel – the software will flash up warnings, beep and then start slowing the car down if you remove your hands from the wheel for more than about 10 seconds. The need to monitor and supervise ProPilot makes it sound pointless, but I’ve found driving assistants of this sort really do seem to reduce the mental load of driving long distances. I think they let you devote more attention to what other vehicles are up to, and help you arrive feeling less tired and stressed. I was less persuaded by another new feature, called e-Pedal. This changes the way the accelerator works so that most driving can be accomplished without pressing the brake pedal. You simply push the throttle as normal to accelerate, hold it still to maintain speed, or lift off to start braking. Lifting off completely provides still stronger braking, right down to a stop. The brake pedal is still necessary for really sharp stopping power, but on most roads both in and out of town, if you exercise a modicum of anticipation, you rarely need to use more than one pedal. BMW’s i3 uses a similar system, and in both the i3 and Leaf I’ve found the system unwelcome. I have two objections: firstly, I don’t want to weaken my habit of using the brake pedal to stop as doing so seems potentially dangerous to me; and secondly, I can’t be bothered to relearn how to drive a car smoothly, since lifting off triggers mid-level braking when I’m not expecting it. A colleague also suggested that the increased dexterity demanded of your throttle foot leads to greater leg strain. I didn’t use the e-Pedal for long enough to verify objection number three, because I switched it off after 10 miles. Thankfully that is something you can do in the Leaf, whereas in the i3 the single-pedal action is a permanent feature. I should also add that most people who’ve tried it seem to like using e-Pedal, so my objections are very much a minority report. Some models of new Leaf feature an automated parking system that I didn’t try, but no doubt works as advertised, guiding the car into parallel, forward or reverse spots even in those awkward herringbone carpark layouts. A reversing camera and a welcome birds-eye Around View Monitor also feature on the equipment roster from the mid-range up. 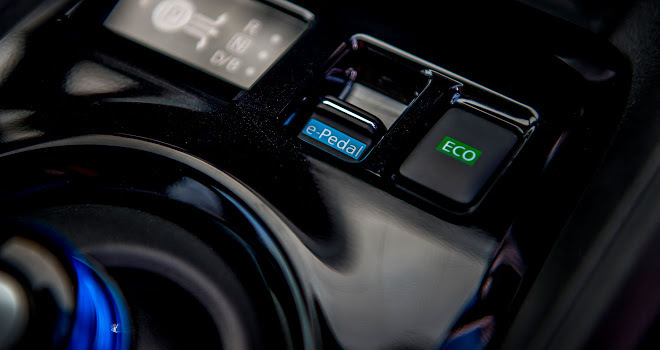 All versions get an Eco button that alters the apparent eagerness of the car, helping you to shave energy usage and so travel a few miles further on a given charge. I preferred the frisky feel of the car in its normal mode – it’ll zip to 62mph in 7.9 seconds when pressed – but Eco mode feels perfectly acceptable even on the twisting ribbon of a Scottish B-road. You could easily live with Eco mode every day and might even enjoy eking out energy, though the old Leaf’s little pictures of trees (awarded for good driving) have sadly now vanished from the scene. 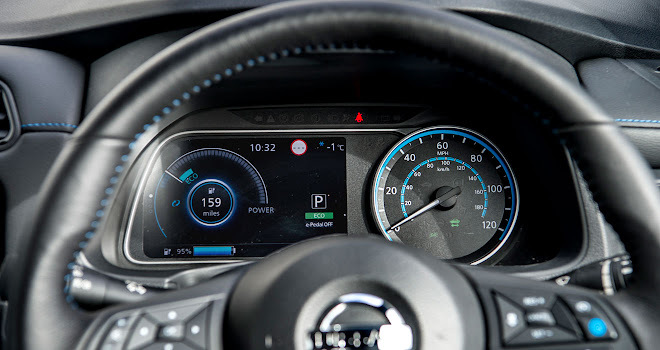 The new Leaf’s instruments are more conventional than the old split-level layout, with a fixed analogue speedometer viewed in conventional fashion through the wheel, to the right of a large digital display showing battery state and a selection of information readouts, accessed via wheel buttons. The most useful screens are probably a demand gauge, swinging between power use and regeneration to help you drive frugally, or a simple digital speed readout. Road sign recognition will also help you keep tabs on your speed. Elsewhere the cabin hasn’t changed drastically compared with previous Leafs. 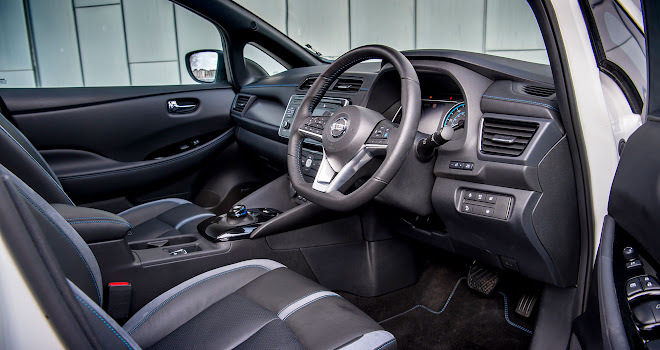 The steering wheel design is much improved and the buttons are more usable, but the central seven-inch touchscreen is lacking in both speed of response and graphical sophistication. When I tried pinching the satnav screen to zoom the map, the software ignored my attempt at such new-fangled digital witchcraft. I also noticed a lot of hard scratchy plastic, despite attempts to lift the ambience of the Tekna version with a strip of stitched mock leather across the dash. 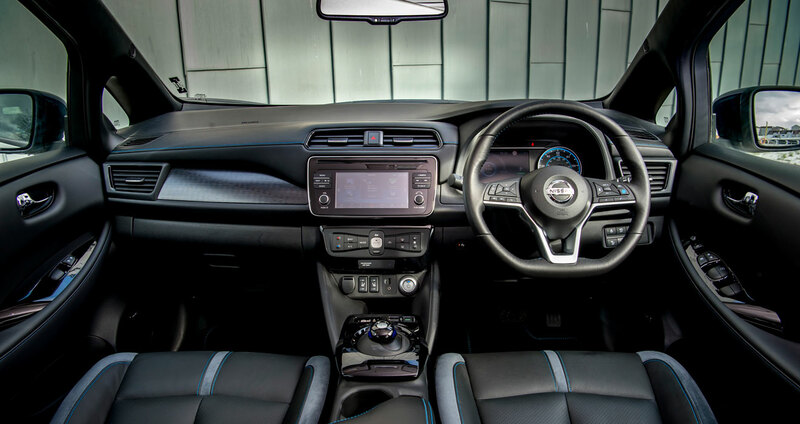 The screen pillars also seemed thick and intrusive by current standards, and the overall impression is of a car a notch below Nissan’s own popular Qashqai, for example. In recompense, the new Leaf did serve up limousine-grade hush over every kind of surface. Refinement has long been a Leaf strength and the second generation has gained new swaddling to stave off the patter of gravel in the wheel arches and other sources of disturbance that would normally be drowned out by an engine. The new EV’s suspension also coped admirably with the many potholes afflicting frost-damaged routes through the mountains. Overall, the 2018 Leaf is another welcome stride forward for Nissan and mainstream electric cars in general. It provides a good balance between range and cost, is comfortable, serenely quiet, and has gained some interesting new technical options. Ahead lies the prospect of a still bigger battery and, hopefully, a fix for that rapid recharging gremlin.